The 76th installment of Desktop Madness features... a bunch of anthropomorphic web browser icons? I refer to this wallpaper internally as the “browser clubhouse.” And yes, that is Internet Explorer 6 that’s not allowed up to play. Personally, I’d be happy to finally see IE6 die a horrible, gruesome death and then vanish forever from the face of the Earth (or, Internet). Sadly, that has yet to happen. 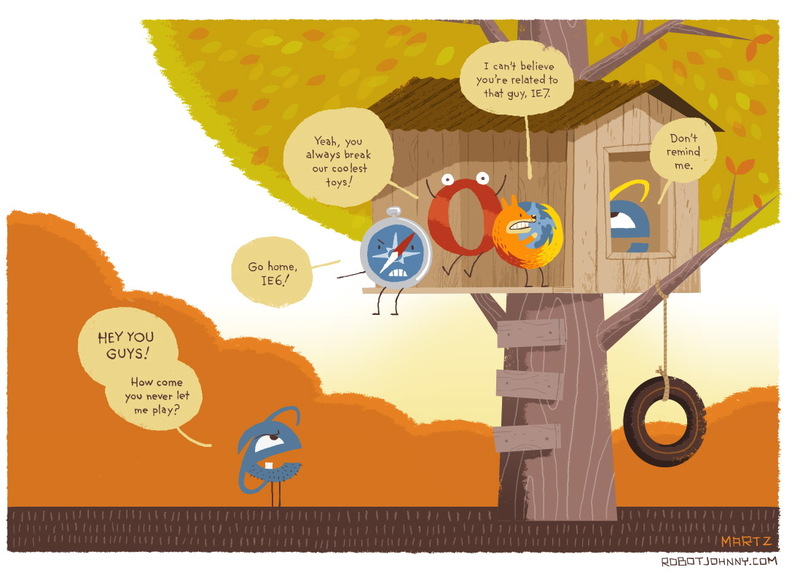 Ah well, at least this wallpaper will make me chuckle and smile while I wait for IE6’s inevitable demise! Original source: John Martz on Flickr, licensed Creative Commons Attribution-No Derivative Works. It’s kind of a fun thing to play around with – and a neat “proof of concept” sort of thing. I know it’s a silly thing to do, but I sometimes like to look at the visitor stats for this website – as well as for the buns’ website and Amanda’s blog. But Amanda is really coming up strong – since starting her blog less than a month ago, she’s had nearly the same number of visits to her site as I have in the same time period. Amazing! I think I’ve created two blogging monsters! The worst part of it is that you could be hit by this exploit just by visiting a “normal” site that’s been infected – being vigilant isn’t enough anymore. The flaw affects even IE7, the latest (released) version of Internet Explorer – so this isn’t just a flaw in older versions of the program. So if you’ve been dragging your feet over changing to a different browser, now’s a better time than ever to switch! I’d recommend Firefox, but any alternate browser (such as Opera, Apple’s Safari, or Google’s Chrome) would do to keep you safe. UPDATE (12/18/2008): Microsoft released a fix for this yesterday – it’s available through the normal Windows Update. Just be aware that you’ll have to reboot your computer (which seems silly for a fix to your browser, but that’s an argument for another day). 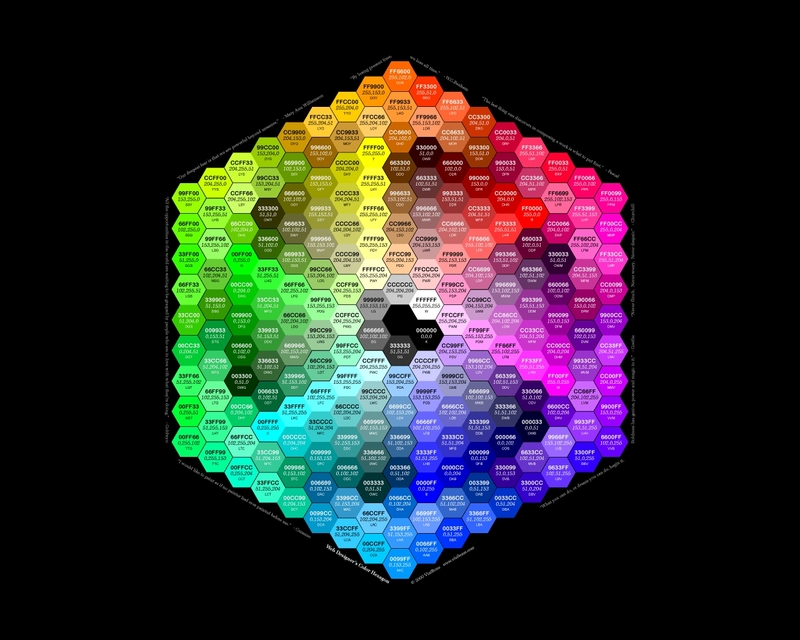 Pretty colors (with their color codes) arranged in a neat hexagon - the perfect complement for your computer's desktop background.